Egyptian President Abdel Fattah al-Sisi has signed a new law that tightens controls over the internet. The legislation on "cybercrime" means websites can be blocked in Egypt if deemed to constitute a threat to national security or the economy. Anyone found guilty of running, or just visiting, such sites could face prison or a fine. But human rights groups accuse the government of trying to crush all political dissent in the country. Last month another bill was passed by parliament, yet to be approved by President Sisi, that would allow any social media accounts with more than 5,000 followers to be placed under supervision. 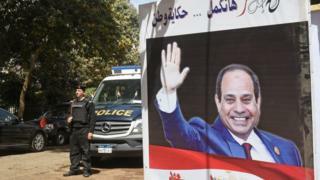 Human Rights Watch issued a warning last month that Egyptian authorities were increasingly using counterterrorism and state-of-emergency laws and courts to unjustly prosecute journalists, activists, and critics for peaceful criticism.